Tyrion, traveling Essos in Illiryo Mopatis carriage, sleeps and dreams of a great battle in Westeros. Could this be a Dragon Dream, a prophetic dream envisioning what’s to come in the future? Is this dream, considering the presence of Bittersteel, a vision of a Blackfyre invasion of Westeros?… The recurring theme of the periodical menace posed to the Seven Kingdoms by the Blackfyre? Is it a prophecy of the return of the Dragons?… Being the Dragons red or black? That night Tyrion Lannister dreamed of a battle that turned the hills of Westeros as red as blood. 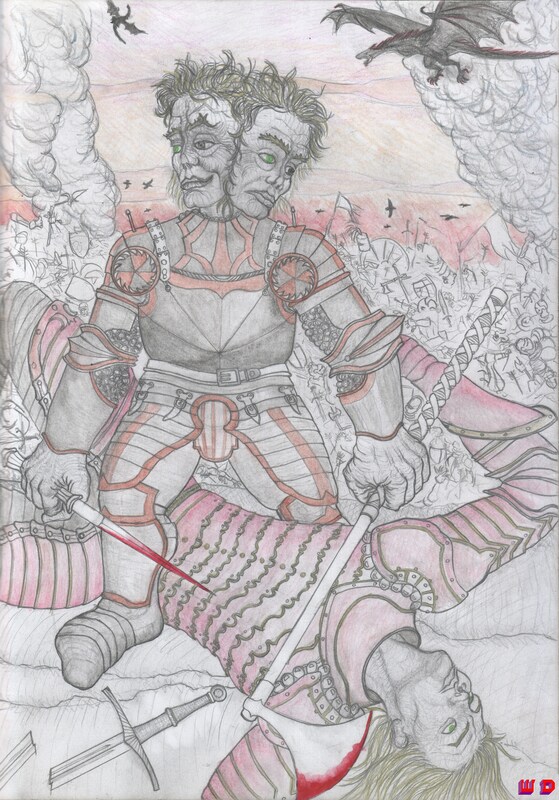 He was in the midst of it, dealing death with an axe as big as he was, fighting side by side with Barristan the Bold and Bittersteel as dragons wheeled across the sky above them. In the dream he had two heads, both noseless. His father led the enemy, so he slew him once again. Then he killed his brother, Jaime, hacking at his face until it was a red ruin, laughing every time he struck a blow. Only when the fight was finished did he realize that his second head was weeping. The dream of the two heads Tyrion. by Winter Design is licensed under a Creative Commons Attribution-NonCommercial-NoDerivatives 4.0 International License.